Along the waterfront in Honiara, a street vendor named Samuel smiles wide showing off his betel-stained teeth as he holds up a half metre-long shell casing for inspection by a tourist. Laid out at his feet among the giant clam shells and pieces of broken coral are tattered remnants of a war fought more than 60 years ago. There’s smaller bullet casings, green glass Coke bottles manufactured in the U.S. of A, tangled pieces of rusted kit, and a battered canteen. A piece of history from the Second World War can be yours for only a few American dollars. Buying it and leaving the Solomon Islands, however, is illegal under the Protection of Wrecks and War Relics Act of 1980. It’s also illegal to take home a giant clam shell under the Convention for International Trade of Threatened and Endangered Species or CITES, which views the species as vulnerable, without proper certification papers. This doesn’t stop Solomon Islanders from digging up remnants of the war and openly displaying them for sale to unknowing or unscrupulous tourists drawn to the country where one of the most important battles in the Pacific theatre of the Second World War took place between Allied and Japanese forces. It also hasn’t stopped relic hunters from searching for prize finds, such as whole vintage war planes, they can surreptitiously ship out of the Solomons, thanks in large part to the country’s political instability, poverty, corruption, and inability to effectively police its own waters. When I met Samuel, I have to admit I was astonished by his wartime wares. Knowing it was illegal (and dangerous) to buy almost all of his “finds,” I settled on one of the Coke bottles as a souvenir of my time in Honiara. Samuel and his buddies thought I was just another stupid tourist paying approximately $2 US for something worth nothing. But to me, I could see some anonymous G.I. from Poughkeepsie or Akron taking a swig from my bottle to slake his thirst in the unbelievable heat of the Guadalcanal jungle. That Coke was probably one of the few treats he had from back home. It was something I could touch from back then. But more importantly, there is a difference between war relics and war junk. The bottle, of which there are thousands littering Guadalcanal, was clearly the latter. Reminders of the war are everywhere in the Solomon Islands. Wrecks of fighter planes and battleships dot the islands, particularly in Iron Bottom Sound off the capital city. The wrecks have become big draws for the country’s fledgling tourism industry. 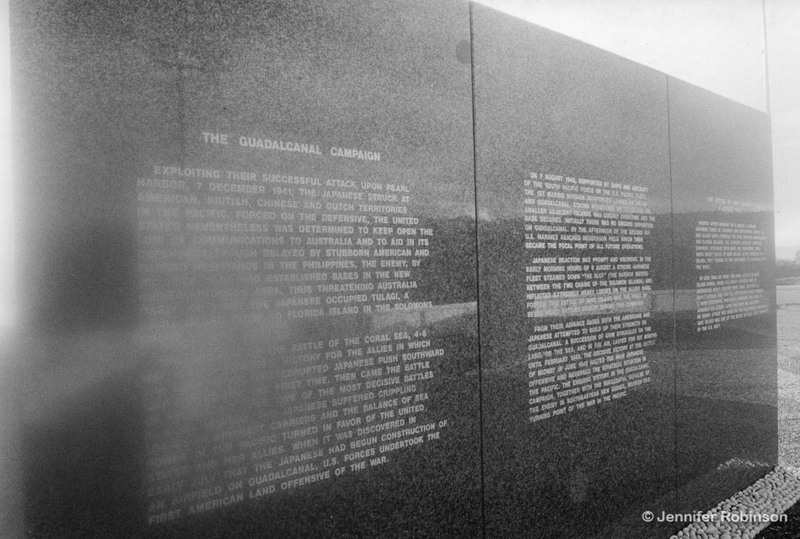 Along with diving with a reputable company, perhaps the best — and most ethical — way of experiencing the war and paying tribute to those who lost their lives during the hellish conflict is by visiting one of the war memorials on Guadalcanal. 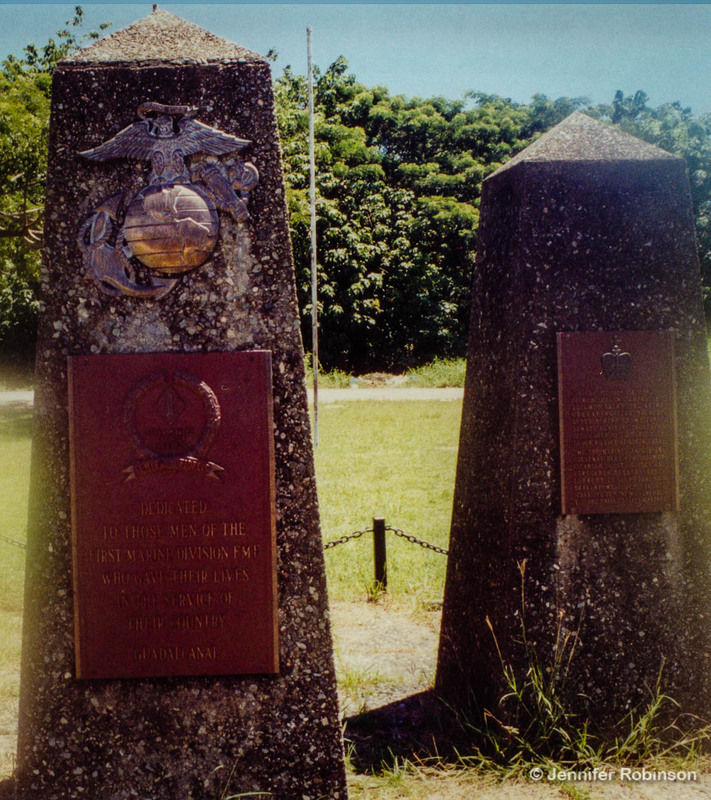 There are two in Honiara honouring American and Allied war dead that are easily reached. 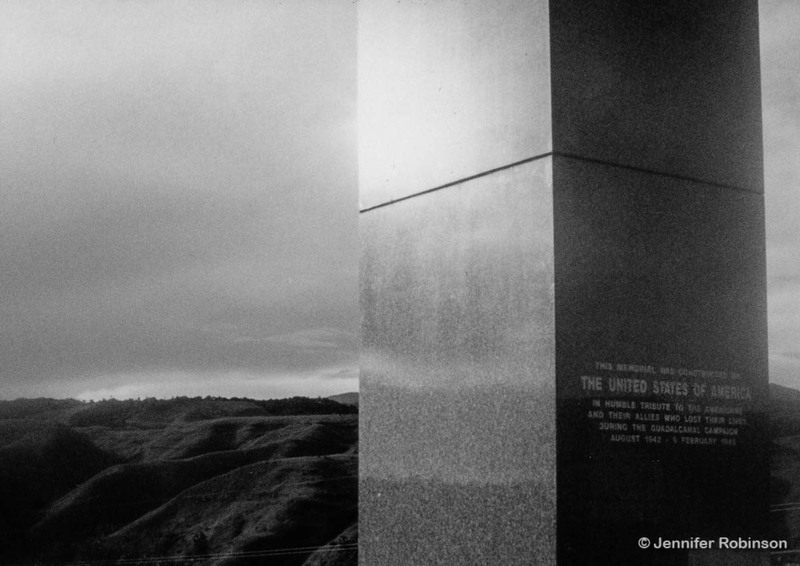 The largest is the Guadalcanal American Memorial on Skyline Drive. Dedicated in 1992 to mark the 50th anniversary of the American forces landing on Red Beach, the site features large white marble slabs with descriptions of the battles fought during the campaign. The best feature is the view. Ships sitting in Iron Bottom Sound are as sharp as toy boats in a bathtub. Looking inland, the grassy ridges where so many bloody skirmishes were fought expose the vulnerability of those who climbed and died under heavy fire from the sea and air to secure them. Another stop is the Battle of Henderson Field memorial at Honiara International Airport. Outside the terminal stand three weathered pillars remembering the American soldiers who took this crucial airstrip from the Japanese in 1942. Next to them is a humble plaque that pays tribute to the other often forgotten Allied soldiers who were there, namely the New Zealanders, Fijians and Tongans. When I visited Honiara in 2000, I was unable to travel to the Solomon Peace Memorial Park at Mount Austin, which is located outside the city limits. At the time, it was behind a cordon drawn around the city by rebel groups fighting for control of Guadalcanal. In 2008, the Japanese-built memorial, which features a bronze statue of a fisherman, was severely damaged when vandals attempted to drag it into Honiara to sell for scrap. Beware: the few tourists who do venture out to the site are warned to be careful since muggings are not uncommon there. Last year, the Japanese community in the Solomon Islands refurbished and rededicated the site. There are also dozens of other sites scattered throughout the islands but most of them are overgrown and neglected. You remember! Damn that lens fungus. May write something about it at some later point. John would have loved this piece! !